This wild ride was released in 1959. 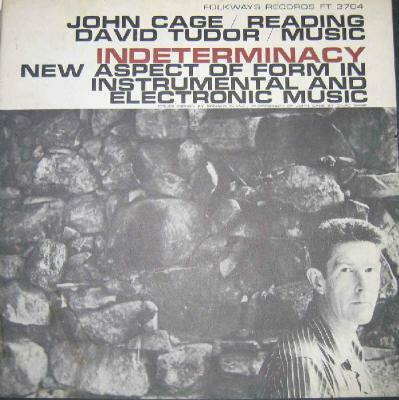 John Cage reads 90 one-minute texts, while David Tudor creates inventive cacophony in another room, out of hearing; so that any relation between voice and accompaniment is purely accidental, as Cage says in the liner notes, "to suggest that all things – stories, incidental sounds from the environment, and by extension, beings – are related, and that this complexity is more evident when it is not oversimplified by an idea of relationship in one person's mind." Cage's preoccupations include music, mushrooms, and Merce Cunningham; personal anecdotes, Zen proverbs and monk jokes, and lots of modernist name dropping. Tudor's palette includes prepared piano, springs, radios, and existing music, notably Cage's 1958 Fontana Mix. Cage complains that at his readings inevitably "someone comes up afterwards and insists that the continuity was a planned one, in spite of the ideas that are expressed regarding purposelessness, emptiness, chaos, etc." Planned, schmanned!